I had this kit from the Old Fashioned Baby. I bought it at the 2009 SAGA convention after I had taken the Circa 1920 French Handsewn Gown class. Thought it might make a nice compliment to the gown. I also am going to be demonstrating the technique at this month's chapter meeting for my SAGA chapter. The lower ruffle of the gown is gathered with a technique known as snail shirring. It did take quite a bit of time. I was told to try the bonnet because it would go much quicker. And it is true, it was. I completed this bonnet in 2 or 3 evenings and that includes the embroidery. I used one of the same embroidery motifs from the gown for the top of the bonnet. 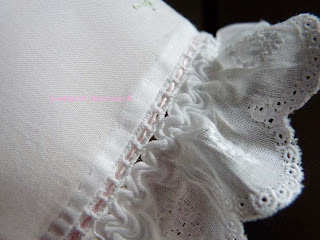 Here is a close up of the shirring attached to the entredeux. A simple embellishment that you can do to any garment dressy or not, is threading simple embroidery through the entredeux. I like a bonnet on a baby but will admit that I am not a fan of a big fluffy uber gathered bonnet. I want to see the baby. This is just enough frill on an otherwise tailored bonnet. Tied with a simple silk satin ribbon embellished with a MOP shank button. So what are you working on? I am not sure what is up next. It is not like I don't have 10,000 UFO's or yarrrrrrrrrrrrrrrrrds of fabric to choose from. I'll have to go diving in my sewing room to find the next project. I love the bonnet! It is so adorable. I learned how to smock 15 years ago when my daughter was a baby, that lasted about 3 years and then she decided that she was a tomboy and would have none of it. I still have my pleater and pick up a copy of Sew Beautiful once in a while and I dream about what I would make. I'd love to start back. And now that I'm pregnant I have a reason to! I can't wait to find out what it is so I can get started on things! I love your blog and all of the hard work that you've put into each and every project that you've shared with us. Beautiful, beautiful bonnet! The embroidery is exquisite and snail shirring is such a special touch. I sure wish I could belong to your Saga group. Would you believe that there is no Saga group in my county?! 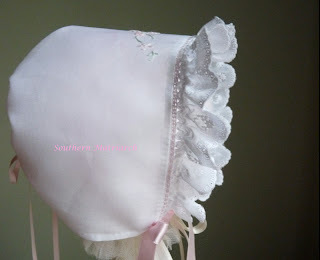 I have hardly ever met a bonnet I did not like! I am especially thrilled to meet this one. So very sweet! That bonnet is so sweet! I love the look of the snail shirring. Thanks for sharing. Robin, congrats on your new little one. I know you will have fun sewing for that new little babe. Karen, thank you. You know it only takes 3 people and about $35 to start a Saga chapter. Not sure where you are but I used to drive an hour to belong to a chapter. Thanks Jan. It is very sweet. Designdreamer, thank you. I love to share with other stitchers. I was on the phone with someone, and trying my best to get off, when I saw this beautiful bonnet. Please do a tutorial on this shirring technique. 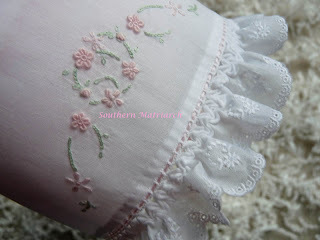 I get to make a Christening gown for a baby girl who is going to be born in May. I love this technique and may want to incorporate it into her dress. What fabrics do you use the most? batiste? Where do you buy your fabric? Do you buy it online? There aren't any good places to buy good fabrics around here. 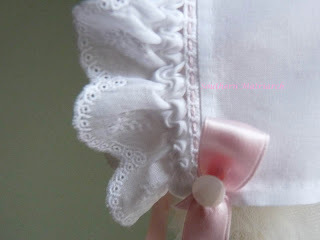 What a darling bonnet! I just LOVE baby bonnets whether they are on a baby's head or not! LOL! Thanks everyone. It was a fun project to do. I recommend it for a quick pretty gift.